June 18th, 1812, 200 years ago, was when the United States declared war on Great Britain. The reasons for doing this were many, and primarily economic. The war between Napoleon and GB in Europe had closed off shipping and ports to Americans, so the US was suffering financially. There was the issue of British ships kidnapping American sailors and forcing them to service as crews on their ships. The border was unsettled and pretty much undefined around the new United States, with boarder disagreements with Canada’s provinces, Spanish Florida, many Native American Indian Nations, and between states themselves. European countries were still exercising colonial powers and involvement in the western hemisphere. Americans were occupying land claimed by the European powers and setting up settlements, and the Europeans were doing the same, setting up forts and occupying land claimed for the United States. So all of these issues came to a head and were particular factors in the war. The U.S. 7th Infantry Living History Association that I am a member of has several upcoming events in the next three years to commemorate the war. Stay tuned for more information on those. As an interesting note on the article: They have a painting of Col. Richard Johnson shown killing Tecumseh. Although he has been credited with that, the thinking now is that nobody is really sure who delivered the fatal bullet. The thought is that Johnson promoted it as part of his political career. It could have been, but nobody is certain. Johnson had a long career as congressman, senator, and then Vice President under Martin Van Buren. He also established the Choctaw Academy School for Indians on his farm that was plagued by fraud and mismanagement. Maybe I need to talk about that more some other time? I could write a whole series of articles on the War of 1812. There's so much to say about it. Unfortunately few people even know about it in our history. That is because schools jump from 1781 to 1861 and forget 80 years of history when our country grew and developed its empire character. So, I will mention here, how the War of 1812 was tied in with Florida and the Seminole / Miccosukee people. And there was a lot that happened down here during the war. Several books have been written on the subject. "The Other War of 1812, The Patriot War and the American Invasion of Spanish East Florida" by James Cusick. "Florida Fiasco" by Rembert Patrick. "The plot to steal Florida: James Madison's phony war" by Joseph Burkholder Smith. You can find all of these on Amazon.com. Florida involved the other reason for the war, which was manifest destiny; kicking out the old European colonial powers and making all of North America part of the United States. Although the US failed to add the rest of north America to the US, the colonial powers were severely weakened, and the US would continue the empire building in North America for the rest of the 19th century. And in the next few years after the war, Florida did become US territory. The US targeted Spanish Florida for several reasons. Spain was severely weakened from the Napoleonic wars. The Spanish government had been changed by Napoleon and Spain had a new constitution, but that meant little in faraway Florida. The same characters remained in charge without any significant change. The US walked into the city of Mobile, which was a city in Spanish west Florida, and just took it from Spain without any contest Claiming that Mobile was included in the Louisiana Purchase and lawlessness was rampant and needed a stronger occupation to bring things under control. American "Patriots" from Georgia invaded East Florida in one of several attempts to annex Florida into the United States. They failed, although Colonel Daniel Newnan declared his campaign of being under siege by Seminoles for a week as a victory. Although the various campaigns of Patriots were attacked by the Seminoles and had to abandon their attempts, they still gave a strategic blow to the Seminoles by destroying Paynes Town and burning Seminole food stores. Then just over the border into Alabama, Creeks killed the American settlers at Fort Mimms, and this brought Andrew Jackson into the war with the start of the Creek War, which would eventually propel Jackson’s career and lead to the presidency 25 years later. After Jackson defeated the Creeks, he came down into Florida to punish the Spanish and English for what he thought was supplying and instigating the Red Sticks. Jackson occupied Pensacola and left a command under Major Uriah Blue to pursue and destroy Seminole or Red Stick towns from Pensacola to the Apalachicola. 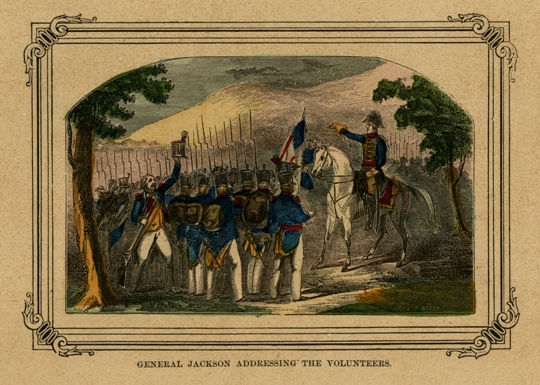 Then Jackson left and defeated the British decisively in New Orleans. Now the British did attempt to use the Seminoles as auxiliary soldiers, just as they have everywhere else with native people. But it did not work out. At the battle for Fort Bowyer at the entrance of Mobile Bay in September 1814, 180 Seminole and Miccosukee warriors were present on the side of the Brits. But the Indians did not advance towards the US artillery like the British wanted them to do, and the battle ended as a failure to the King’s Navy. After that, the Brits decided that the use of Native axillaries was unreliable. So by the time of the Battle of New Orleans in December 1814, the Brits did have 500 Seminole or Miccosukee warriors with them, but never employed them on the battlefield. They did employ the more disciplined West India Regiment, who mostly froze to death because they did not have winter clothing. So in the end, the Seminole and Miccosukee people in Florida ended up the victims. Pawns who were used by Great Britain and then discarded when the Crown Forces left. Pretty much the same thing as what happened in the north with British support of the Shawnee. This set the stage for a hostile relationship with the United States for the next several decades, and gave the push for Indian removal. I wish you would write some articles on Florida and the War of 1812. Most Floridians do not know much about this subject. Thank you for listing a few titles of books that cover this subject. Answer: I have written a few articles here. Otherwise, nobody else wants to hear from me.